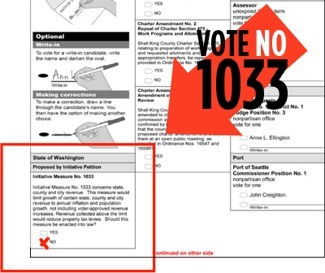 The No on I-1033 campaign points out where the initiative is located on the ballot. We’re just six days from an important off-year election. Review our endorsement cheat sheet. I argue that County Executive candidate Susan Hutchison is dead wrong on transit. The PI covers it. The Times contrasts how Constantine and Hutchison would fix Metro. Hutchison was for the ferry district, before she attacked Constantine over it. Polls show good news for Constantine and Mallahan, say that I-1033 is failing. This is an open thread for all things election related. Hutchison complained that Link to the airport was a wasted effort, because she can catch a ($50) cab faster…and in the same breath, said ST should have gone to Bellevue first. That was July. Then, October rolls around, and she proceeds to oppose light rail to Bellevue. This is the good part of going to a non-partisan system for local elections and a top-two primary. The bad part is the specter that a republican like Hutchison could slip through and actually win, but on the other hand, suppose that two democrats had made it through the primary, like they did in the Seattle Mayor’s Race or nearly every one of the City Council races. Everyone knows Seattle and probably king county is going to vote democrat, but with non-partisan elections, those democrats still have to run a competitive race and liberal seattle gets to choose which liberal they like better. Hear, hear! I am about as liberal as they come, but I respect principled conservatives, and can even see their side of most arguments. But WA state Republicans simply cannot find a non-crazy candidate to field. They’re either corporate sociopaths like Hutchinson or religious crazies like Ellen Craswel, or that weirdo they ran against McDermott. Given the all-mail voting, I wouldn’t say that we’re six days away from the election, but in the midst of one that ends in six days. Seems weird! I know it makes elections a bit different. More like american idol or something. Many of you may know that I was strongly against McGinn simply because of the 99 tunneling. I feel that the tunnel is the best option, but I’m not here to discuss that right now (feel free to send me FlickrMail if you want to chat about it). A few weeks ago I reviewed each candidates positions and decided that I’d really be screwing myself by voting Mallahan and decided to go with McGinn. Two days later, he came out and said he’d be supporting the viaduct replacement plan that the state goes with. So w00t! Actually, I think McGinn is an all around strong candidate. Ideally I’d like to see Nickels in there for another 4 years, but that’s not going to happen so I’m happy McGinn is here. I think people who expected for McGinn to take this after the primary results (myself included) have gotten a big wake-up call. It’s so clear how different the parameters of the general election are compared to that of the primary. A lot of Nickels opponents pretty much voted for any one else out of desperation and now there are more undecideds than ever. I kind of assumed a lot of Nickels supporters would default to McGinn, but that’s not really happening. BTW – not election related, but I rode Link today at about 1:00 from Beacon Hill to the ID and the train was packed, standing room only. I rode on the 5:35 AM train from Westlake to TIB and the bus to SEA yesterday to go to SF for the day (I only rode on electrically powered transport the whole time I was in SF, about 6.5 hours). There were about a dozen of us going to the airport at that hour, and we were the train until 3 high school kids got on at Mt Baker and got off at Rainier Beach just after 6:00 AM. I rode Link today from Rainier Beach to IDS at around three and it was almost empty… Although I think the other car had a lot more people, and we were only three or four minutes after the one before us, so it’s not too bad for a reverse-peak run. Well, I can attest to the fact that Link is ridiculously crowded during the 5 p.m. rush southbound. Barely even any room to stand. You have to be aggressive on the platform at Westlake to get a seat. Oh, and since the original comment was about approving R-71, I think it’s also worth sharing why defeding LGBT rights in general is a transit and/or environmental issue. Anything that makes anyone feel safer in their community will get people out of their individual cars and onto transit. If you’re worried about your personal safety because you fear being targeted, driving seems a lot more attractive than riding the bus. If we can make everyone feel safer, more people will ride transit. I know this isn’t specifically what it’s about, but R-71 certainly is an expression of how our state as a community feels. Well said Matt. Thanks for “linking” my Yes on 71 comment to transit! 1 pm link train full? Lunch break? Remember kids, write in PAT DAVIS for Port of Seattle Commissioner!! Good riddance there! What a useless Port Commissioner. If you don’t like Pat Davis, then don’t vote for Tom Albro. He hired Pat Davis’ campaign manager, he is funded by a long list (more than 100) of Port insiders, and 70% of his top funders were Davis’ funders. I agree wholeheartedly with King County executive candidate Susan Hutchison; let’s put light rail on the new 520 bridge [“Is switching light rail to 520 feasible?,” page one, Oct. 23]. This is a prime example of common-sense thinking, something all to rare with politicians these days. The problem is getting to Seattle, not getting around Seattle. Putting it on 520 would create a light-rail line that runs right through the hearts of Redmond, Bellevue and Seattle, benefiting real people who commute to work and school each day. House Transportation Chairwoman Judy Clibborn of Mercer Island is quoted as saying, “This is what you get when you have people who have not been involved in regional transportation planning.” Well Clibborn, after seeing the backward mess the regional transportation system is in, maybe it’s time to start listening to other people. Though I suppose it can’t be too hard on Clibborn to commute to Seattle, after all she is from Mercer Island, which falls along the path of the current light-rail plan — you know, the one she supports. But I can understand why her and other career politicians like Dow Constantine are afraid. If all these non-politicians start fixing our problems, there will be nothing left for them to campaign on. Constantine just came out with this delicious little ad. Actually I think that may have been put together by horsesass.org – apparently TVW has been contacting YouTube demanding that none of their video appear there – even fair use excerpts used in political commercials.